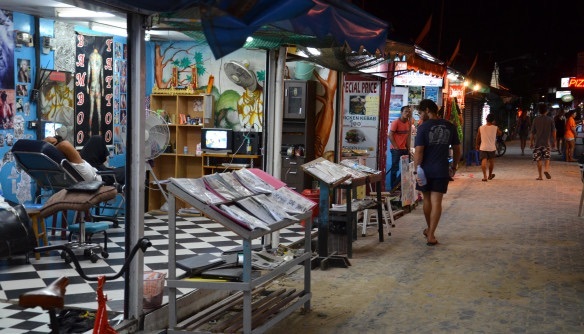 From the moment you step off the long tail boat onto the island of Phi Phi your greeted with traditional tattoo parlours shamelessly displaying their array of designs and creative abilities. Bamboo tattoos are the traditional form of tattooing in Thailand. This Asian technique dates back around 3000 years and the process involves taping a needle to a bamboo rod and repeatedly tapping the needle into the skin to leave an ink mark. This tradition started with Buddists, monks would have tattoos symbolising their faith, however now, it’s more an expressive art. By the time we reached Phi Phi this was to be my fiancés second tattoo, like wise for his friend we were also travelling with. However for others in the group it was to be their first, so they stuck to small symbols rather than a large design. All 5 lads settled on 5 dots symbolising the face of a dice which they had imprinted on alternative areas of their body. 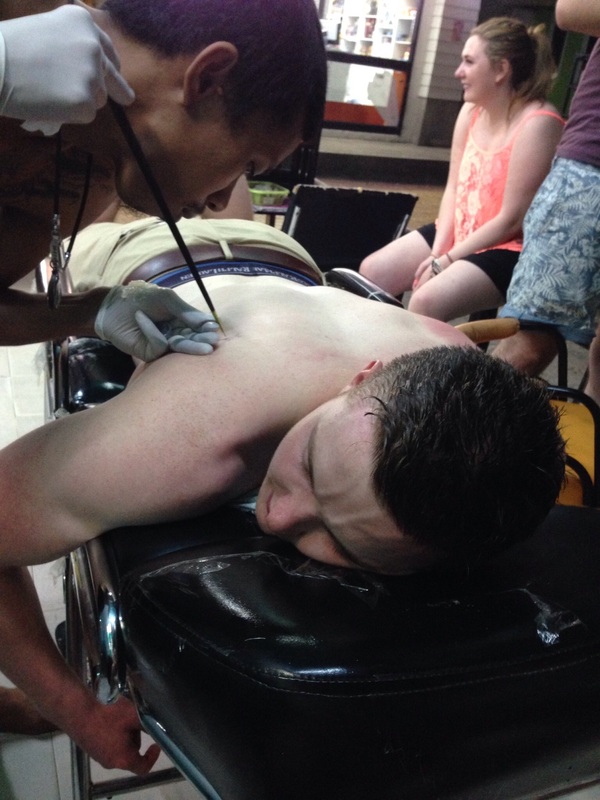 The traditional position for bamboo tattoos is the shoulder blade which happened to be the place Sam and Ben opted for. Possibly the best aspect of a Bamboo tattoo is that they hurt far less than a machine tattoo (so I’m told!) and their produce no scarring/ bleeding or swelling of any kind. It is not nessecerity to even wrap the tattoo after practice and within 2 hours the fresh tattoos were exposed to seawater with no pain or even any notice of them being present. Tattoos take a little more time than a machine would achieve as tattooists are required to refill the needle with ink. Convinced, here’s a couple of pointers before you jump into it. 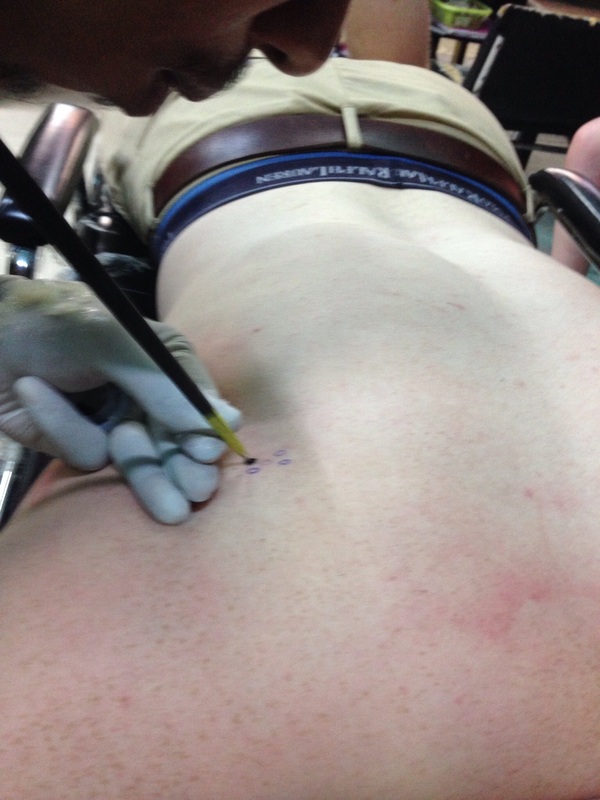 A lot of travellers pick their design when they’ve had some Dutch courage so if your considering a tattoo do some research of your design ideas before you go. Haggle! We bartered a great price for 5 tattoos and happily settled at 750baht per tattoo (that’s £13). It’s ok to check the needles, infact I had numerous in depth chats with the artists before starting the process, they let each person pick out a fresh needle, watched them sterilise and wear gloves for the whole process. Ask about. Check out other people’s designs and see where they had theirs done! Have you ever had a bamboo tattoo? Share your stories! Bamboo tattoos are the traditional form of tattooing in Thailand. This Asian technique dates back around 3000 years and the process involves taping a needle to a bamboo rod and repeatedly tapping the needle into the skin to leave an ink mark.